Eyrie| Painters Chair Fine Art in Coeur d'Alene, Idaho features original paintings, sculpture, prints and much more. 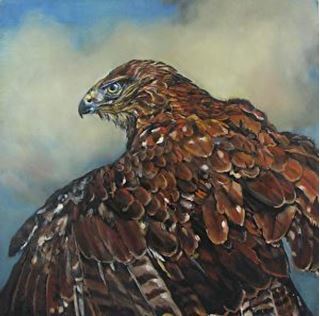 "Golden eagles, birds of prey, are beautifully feathered. So of course I had to paint one and explore the feathery magic that adorns these birds." This piece is gallery wrapped and ready to hang.